This is the subtext for our blog. Eat food. Real food. And as we have met so many fascinating people through this blog – and seen so many fascinating and clever approaches to eating healthfully (and joyfully! ), Little Sis and I come back to what started all of this blogging for us. Real food. 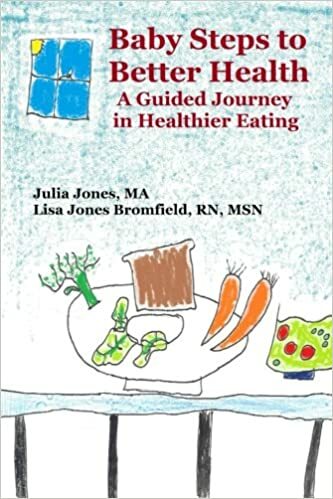 It is a difficult but rewarding journey to procure, prepare and eat real food within this crazy, convenience-ized, instant gratification culture of ours. There are many wonderful epicurean lifestyles out there that claim to improve people’s health. Sometimes they are at complete odds with each other and both sides claim to have scientific ‘proof’ that their diet is the one that will lead all people to optimum health. Well, since when has one approach ever led even 75% of the world’s population to the same conclusion or end goal? I mean even the notion that we should be kind and not kill each other is present in all the world’s major religions and yet, we’re still killing each other! But let me get back to food. Real food. I would argue that be it the Paleo diet (lots of meat and veggies – little carbs) or a plant-based diet (with or without oil), vegan vs. vegetarian, no dairy vs. yogurt-makes-people-in-the-Caucasus Mtns-live-into- their 100’s… these diets improve people’s health when, and perhaps primarily because, they decrease the amount of processed foods in the diet. And do you know what processed food includes? Sugar is not a natural food. What? Bigg Sis have you lost your mind? Sugar is the MOST natural food. It’s what plants make from water and sunlight. It’s what your brain consumes to allow you to sit there and type out your thoughts. Sugar is the only food. Let me elaborate. Refined sugar…. concentrated sugar…. sugar beyond the amount that exists in the wonderful fruits, vegetables and milk we have at our disposal is not natural. Even sugar cane has other stuff in it. It doesn’t pour out of the end of the cane like a Pixie Stick! Our bodies use incoming calories to make sugar and energy, but our bodies evolved, were created, came into being, with lesser amounts of the stuff than we currently consume. And sugar, as in refined, as in un-natural amounts, is proving to be a very bad physiological choice for humanity. Hummingbirds seem to do okay with it, but not humans. So, as far as taking the first steps to improve your health via a nutritious, and beneficial diet? Reduce processed food. Reduce processed food and you reduce sugar – along with a host of other nasty chemicals that are also used as rocket propellant (sodium nitrite a meat preservative) and boat cleaner (azidocarbamide – a dough conditioner). Little Sis and I are thinking that along with the series we did on sugar, we’d like to share how we have reduced the processed foods in our lives. We’re looking for the common things that many people like to use and abuse that they think are cheaper and more convenient. We abused too! I promise. I used to think it was a healthy choice to buy Mrs. Paul’s fish filets as opposed to the sticks! I think once you get used to a slight change here and there in your routine, you will find that our methods do not take more time and are definitely not more expensive if you measure cost per nutrient. And hey… hospitals, diabetic supplies, dialysis, drugs, and coffins are WAY more expensive than any of the concoctions my cheapskate little sister and my-cheapskate-self have come up with. So I’d like to offer several more alternatives to boxed cereal – one of the MOST egregious users of sugar. 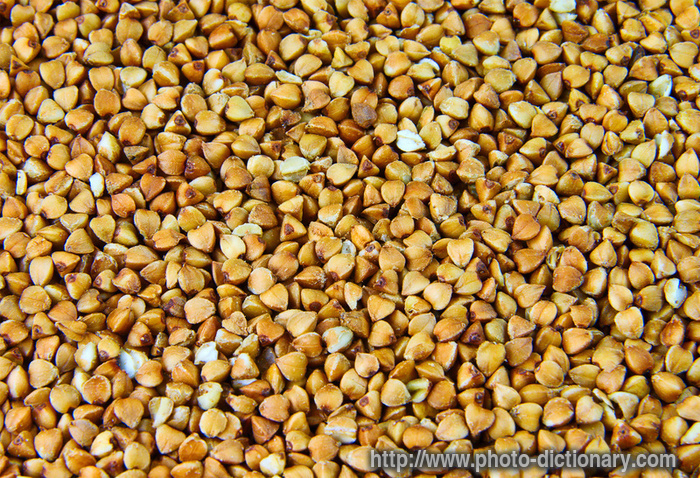 Buckwheat is not actually wheat – it is a seed from a non-wheat plant that is somewhat pyramidal in shape. For this recipe you want the actual seeds, not flour. 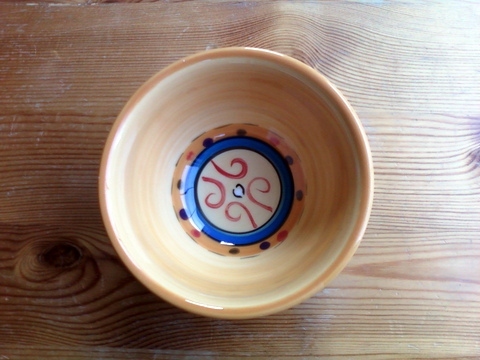 Place in a bowl and cover with about 2″ of water. Cover the bowl and let it sit overnight. Rinse until the water runs clear the next morning – it will look a little cloudy and slimy. Serve as is or add a little almond, soy or cow’s milk along with some raisins or chopped dates, nuts, or other fruit, a little cinnamon adds some sweetness as well. Make your own Granola on the weekend and enjoy all week long! 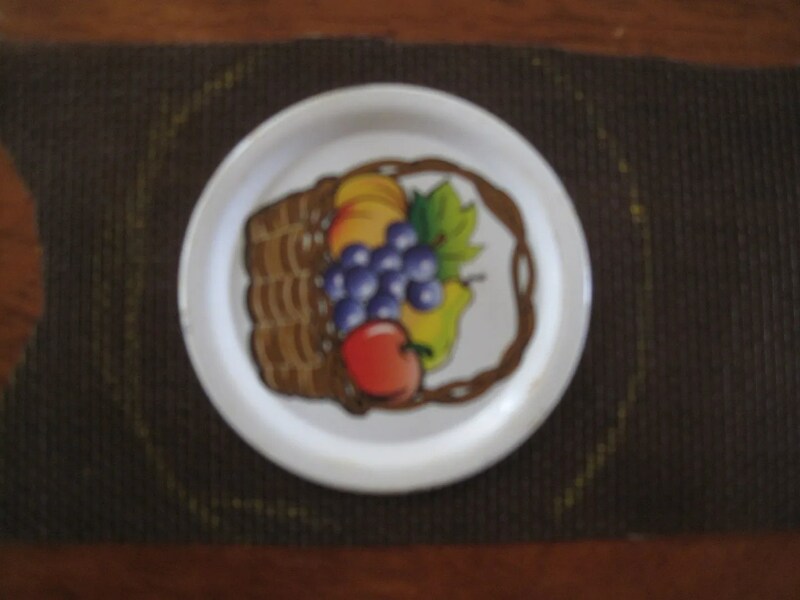 And lastly – for replacing processed breakfasts – to add to Little Sis’ wonderful pancake recipes – a relatively simple mix. Make the dry ingredients ahead of time and your morning routine will be quicker. In fact make 2 or 3 dry batches in advance! After everyone has eaten, lay the leftover pancakes on a plate, put them in the freezer and the next day transfer them to a plastic bag for future breakfasts. I usually make 1 & 1/2 or 2 times this recipe so there will be leftovers to freeze. One need not eschew everything one loves to achieve a more healthy diet. Unless of course all you love comes from the back of a Hostess or Frito-Lays truck. But part of the journey is finding the healthy foods that work for you and your family. Find the foods that bring you pleasure while nourishing your body. You may just find that list expanding as you try new things without the numbing overly sweet and salty tastes which the processed food industry would like us to crave. Keep us posted on the new discoveries that you make. We have learned so much from the input, comments and blogs of our on-line companions on this journey. It is nice to be in community with you! The last time I tried sprouts was MANY years ago, when they were only available in the health food store, and the health food store was a small, locally owned affair with hand painted murals on the walls and revolutionary music and patchouli in the air. Lest I give you the wrong impression, this was in about 1991. 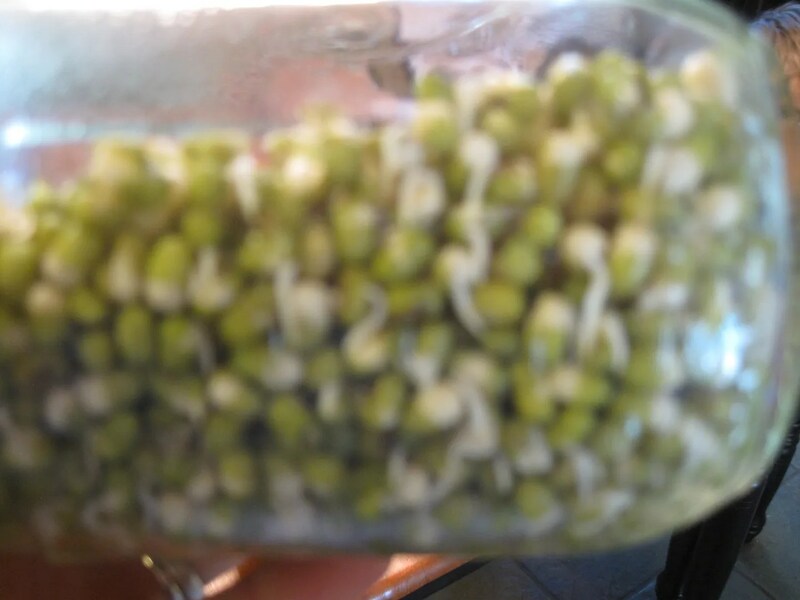 You may be surprised to find that I did not become a sprout loving Momma until recently. When I tried them before, they were okay. Just okay. There were an awful lot of them, however, and they DO spoil; I didn’t like them enough to try to plan meals around them (planning really wasn’t my thing at the time), and since I was only preparing food for myself, the math simply didn’t work out. They were too expensive. Flash forward and EVERYTHING in that last sentence has changed. 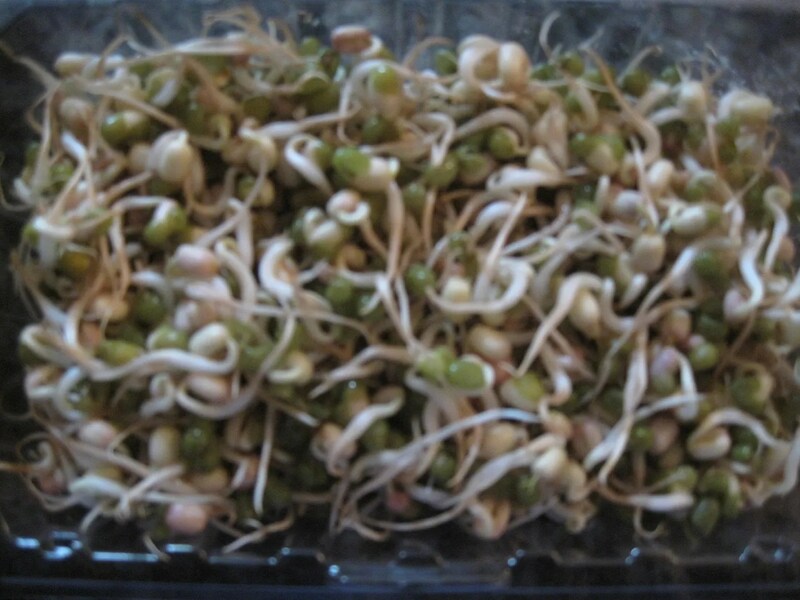 To grow sprouts, you need a sprouter. You are welcome to buy one, but I am too cheap to do that, so here’s my solution: large canning jar with 2 part lid and some mesh. I happened to have clean window screening material from making beach bags for kids, but I imagine any mesh would work. 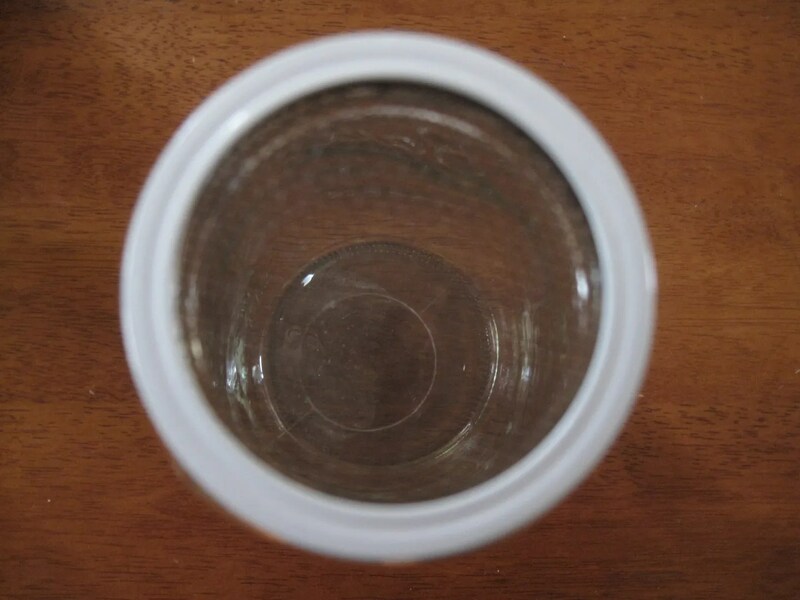 stretched the mesh tightly over the top of the jar and screwed the outer ring on tight to check for fit. My sister’s hand… oh wait, that’s me. Weird. 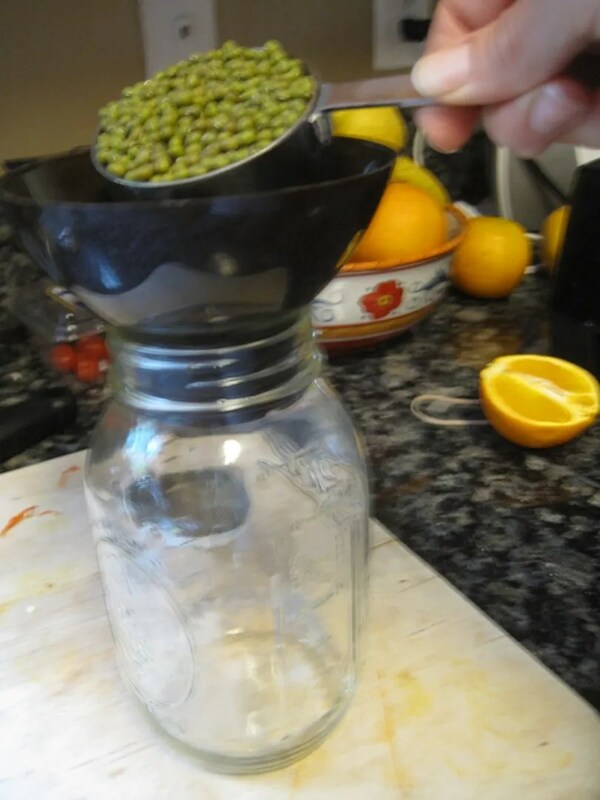 and added water until the jar was nearly full. I left them to soak overnight, drained the water by turning it over (with the lovely screened lid still on…. doh). 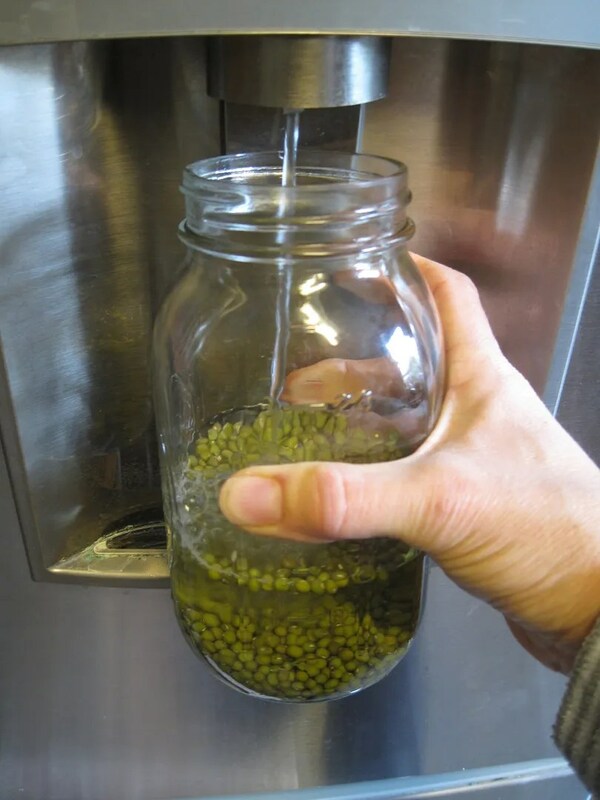 And the next day rinsed the beans with fresh water, and drained them again. Many of the skins had cracked. I proceeded to rinse them twice a day for the next couple of days and watched their astonishing progress. 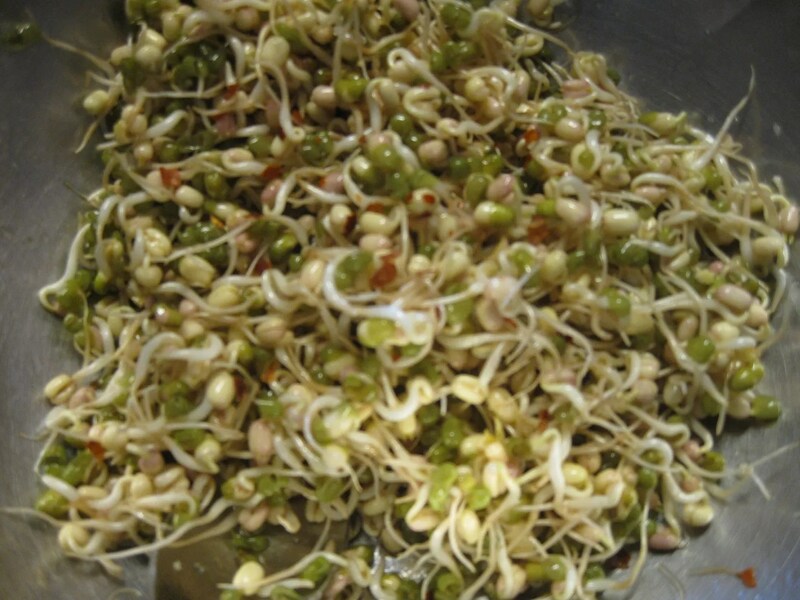 There’s the sprouts we’re looking for – rinsed on the morning of day 4 and put in the fridge. And so we’ve proceeded to eat them with everything, because they’re awesome. And they cost me about twenty cents. 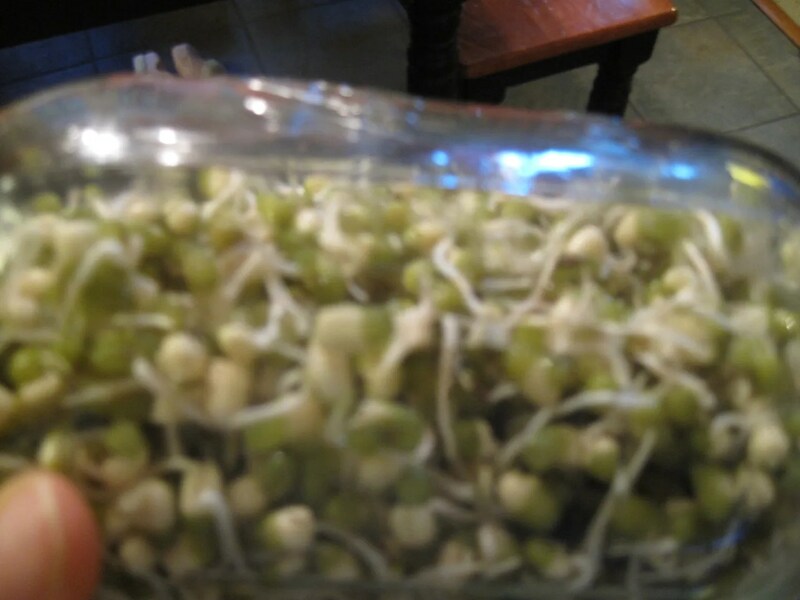 Yep, twenty cents to fill a one pound strawberry container with delicious homegrown sprouts. Ahhh nothing more satisfying than some thrifty nutrition. Doesn’t get much easier than this kind of procedure. Put all in bowl, toss. Wait 20 minutes or so. Eat. Love. We had ours as a side to veggie burgers at lunch, but I could easily see adding it to the top of any Asian dish with crunchy scrumptious results. While I must confess the kids wouldn’t touch this one, I should also say that I was glad, deep inside, that I got to eat that much more. Delish. Fabulous Friday!! What better time to continue our thrifty examination of nutritious lunch options? To get us ready for next week, I’d like to outline some basic strategies that I’ve used to prevent fast food infractions. Take a look and, if you are a lunch eater outer (my daughter’s nomenclature), maybe it’s time to take a baby step and choose one strategy to try next week. If you already bring lunch, but find that your mid-day meal is a little yawnsville, maybe one of these strategies can add a little skip to your step. Option 1: Big Sis made some awesome suggestions for Straight-Up and Mix It Up Leftovers Remember… the remains of last night’s dinner will not stay edible; they will begin the inevitable transformation that occurs in the back corner of your refrigerator that ends with a mysterious noxious odor. (Ever thrown a food storage container away JUST TO AVOID OPENING IT? Yes, you have. I have too.) To add to the grocery list? Slightly more for each dinner you prepare and a container to put it in if you don’t have a plastic yogurt tub you can use. Done. Here’s one of our favorite (super cheap) family dinners that makes plenty of leftovers, freezes beautifully, and is very flexible, so you can add other elements to it as you see fit. We always make a double batch and lately I’ve been adding sauteed mushrooms and celery. This recipe came from a fun old book on my shelf, The Tightwad Gazette. If you come across a copy at a yard sale or second hand book store, grab it. There are a lot of thrifty treasures in there. 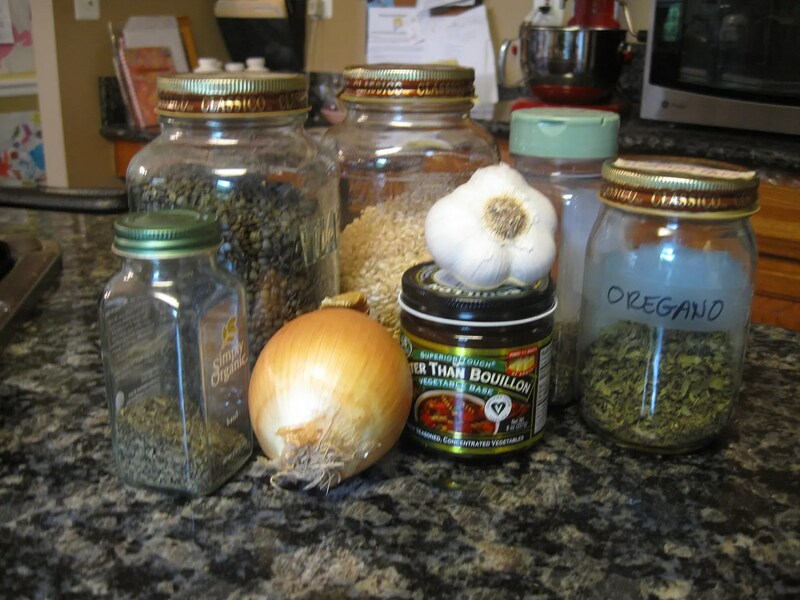 Leftoverlicious Lentil Casserole – I always double this. I have found the Crock Pot to be the best method for this casserole. Place all ingredients in crock. Cook on low for 2 hours, high for 2 hours. If you are using cheese, spread it on the top of the casserole for the last 25 minutes of cooking. I assume you could simply leave it on low for longer, but I usually need it to be done sooner rather than later. So there you are, a hands-off Sunday dinner that will make lunch too! Option 2: Burritos/Wraps/Sandwiches Big Sis mentioned using your leftovers in many clever ways and one of the smartest disguises is plopping that stuff in a tortilla and adding whatever salsa or veggie dip floats your boat. Or throw a bunch of veggies you don’t usually eat on a sandwich into a wrap with some kind of sauce or spread. That takes about 30 seconds. Wrap it up and put it in bag with a piece of fruit and a carrot, another 30. 1 minute express lunch. To add to your grocery list? A package of whole grain tortillas or flatbread, salsa, and wax paper to wrap. Done. Option 3: Weekend Prep. Weekend prep may mean making a casserole or whipping up a large batch of beans and rice or something else that is sort of flexible – remember that riffing on a theme idea? Beans and rice with cheese and salsa; beans and rice with tomatoes and lemon juice; beans and rice with soy sauce, peas and spring onions; beans and rice with mango and cilantro; beans and rice with sour cream, chili powder and lime juice. You get the idea. Not a bean fan? Quinoa is another heavy hitter in this department as it has protein built right in. Just make a ginormous pot of quinoa and then riff on it all week, using various bits or adding small portions of leftovers that you would normally throw away because they’re “too small to keep.” To add to your grocery list? Beans and rice or quinoa, some bits to go with if you don’t have any of those listed above. Container if you don’t have one. Done. Option 5: The Backup Plan If you are fortunate enough to have a refrigerator where you work, it may be in your best interest to keep a backup plan there. For me this was good bread and peanut butter. 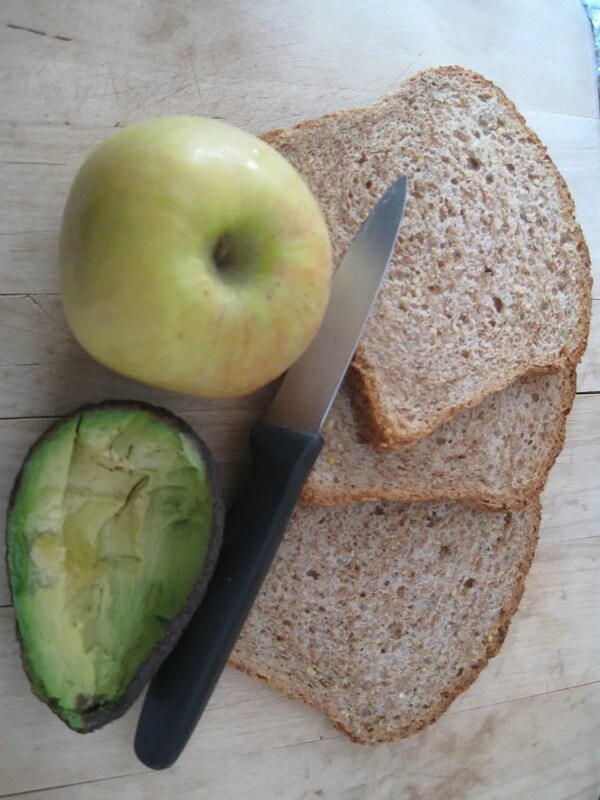 While I love both, it is not something I would choose to eat on a daily basis; however, if I was unable to get lunch together or needed a snack, or when I was pregnant with twins and it was time for third breakfast, there was my friend the bread with peanut butter. Add a few raisins and you’ve got yourself a party. How about trying some hummus instead? Prepare it on Sunday and take it in to work in a container on Monday with your nice bread or whole grain crackers. To buy at the store? Whole grain bread, peanut butter, hummus ingredients if that’s the way you want to roll. Container if you need one. Done. You never need order from the Dollar Menu again, or refer to your lunch as a Number 4 Combo. 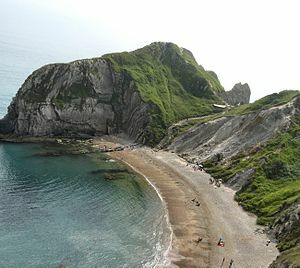 Now start researching vacation possibilities and thinking about how nice it will be to not feel completely tired and little sicky-full for an hour and a half after lunch every day. While I could continue to talk about breakfast until, well, probably for a very long time, Big Sis and I thought it might be more helpful to take a more rounded approach, and thusly we’ve moved on to lunch. I admit that as a work at home parent, my perspective on lunch is probably a bit warped, but I did, in my former life (and by that I mean before children, don’t get weirded out), work in the outside world. My feelings about lunch are probably most influenced by 1) my desire to eat something healthful and 2) my limitless capacity to be a cheapskate. There was a time in our pre-kid two salaried life where my husband and I faced that “where does it all go?” money question. We sat down with our bills and bank statements and it became very clear that the dinner time restaurant extravaganza we were enjoying was problematic. We devised rules and our monthly finances eased considerably. Not long after this exercise, we looked for the less obvious money drains in those same bills, and not so surprisingly given our predilections, it became clear that lunchtime had its own challenges to our new frugality. The office lunch, the lunch date with a friend, the quick lunch on the corner, that awesome lunch truck that’s only in that part of town, the birthday lunch, the sad colleague lunch, the happy colleague lunch, the I hate my job lunch, the sunny day lunch…. Let’s do some quick math. Most years have 260 work days (thanks, Google). If you get two weeks off, that’s 250. If you get federal holidays, that’s 240. Let’s go with 240, even though I realize it doesn’t necessarily reflect everyone’s working reality. How much do people spend at lunch? There are a number of estimates out there, so let’s use some logic. I’m going to say the cheapest you can pull off is about $3, and that assumes ordering off the dollar menu at somewhere oogie, I mean at a fast food place. I’m pretty sure a granola bar and a drink at a convenience store would get you pretty close to the same amount, so I’m going to go with $3 as the bottom. On the other hand, if you go sit down somewhere, it seems to me you are likely to spend at least $10 (and that would be something relatively inexpensive like Pho or pizza). So let’s slice it down the middle and call it an average of $6.50. This is on the conservative side of the average estimates I found online. Employing my meager but serviceable math skills, 240 x 6.50, that’s $1560 per year on lunch. We will be taking two vacations this year for about that much money. Do you like those lunches THAT much? And if you do, are you closer to the $6.50 estimate here or are you straying into the $10-12 territory I saw mentioned many times. Let’s run with $12 as well… 240 x $12, that’s $2880. Almost three thousand dollars friends; and pardon me for saying so, but much of it is for food that is NOT doing anything for you; I’m quite confident you could benefit from a vacation at that price tag. I’m also confident that we can give you some solid strategies and some more delicious and healthful options to get you through the gauntlet of work lunch. Our course is charted – homemade lunches that feed our hungry cells and vacations that restore our spirits. Beach sand or bust!! So you think you’re stuck with fast food or bologna for lunch, eh? That is a bad place to be stuck my friends and I’d like to help you out. Lunch is problematic for a lot of people because the traditional lunch repertoire is rather narrow, i.e. gets boring, i.e. forces you to not make it – settle for mediocre – go out for evil fast food. It is a mire of danger, despair and disease awaiting you at noontime everyday! Yikes, this is getting scary. So in the tradition of Baby Steps and Riffing on a Theme in the Kitchen (I hope you were singing while you made that incredible orange hummus yesterday Little Sis)… I’d like to offer the Grand-wich and the Expand-wich. 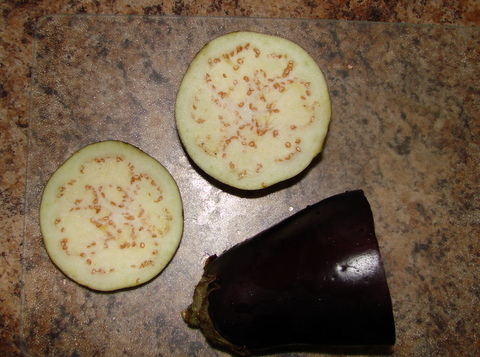 Sunday I looked in my fridge and found a humble eggplant, bought on sale with several vine mates that would soon be going bad because I bought too many. I thought, “Gee wouldn’t a roasted eggplant sandwich be good?” “Yes it would,” I answered myself, “But I don’t have time to roast any eggplant right now!” So I nuked it instead. Slice veggies about 1/4 – 1/2″ thick. The other I drizzled with olive oil, rice vinegar and Bragg’s – again maybe a total of 2 – 3 tsp, but this one is meant to be super easy and fast / not really necessary to mix or measure : just drizzzzle. 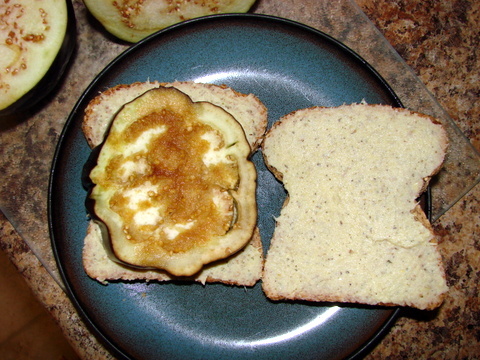 Placed my eggplant on a slice of Ezekiel bread that I’d spread with artichoke spread. lettuce, tomato, cheese, other veggies (hot or cold) or if you eat meat – some roast chicken or turkey left over from another meal. Now to make it a grand-wich you add a new and different topping! See beyond the mustard or mayonnaise in your fridge (although as Baby Steps are still encouraged if you eat more vegetables with your mustard and mayo that is a VERY good thing). The artichoke spread I used above has a very mayonnaisey consistency. I described a veggie and bean dip and Little Sis described a scrumptious sounding orange hummus in our most recent posts. Veggie and bean spreads make your lunches healthier and more interesting. Worth packing. Worth eating and worth investing a little time in. But really is it any more time to make a lunch the night before than it is to leave your place of work to go spend too much money on food that is not very good for you? leftover roast chicken with leftover roasted potatoes, carrots, sweet potatoes and beets – with mayonnaise, hummus or artichoke dip, or lettuce for some moisture. leftover roast chicken with leftover pasta sauce – preferably that has big chunks of vegetables like zucchini or eggplant or spinach or swiss chard or onion… you get the idea. You can top with cheese if you like! leftover greens sauteed with garlic and cheese….or hummus…. or other bean dip. So you see, the bread or tortilla or wrap is your canvas and a great variety of foods are your colors… and as simple as it is, the combinations are endless. Let us hear about your Grand-wich and Expand-wich creations! When a musician “riffs on a theme,” she keeps some core element of a bit of music and adds new bits, changes it in some way, re-interprets that bit in a new way. She may do all of those things. Some central and fundamental bit remains, the theme, but the riffing is what makes it new, fresh, and individualized. Riffing on a theme is a great way for someone to get into cooking and to provide a wide variety of dishes based on a few core theme dishes. The spinach namul dish that I wrote about a couple of days ago is like this – you can riff on the namul all over the place and have a wide variety of nutritious and delicious veggie bits. The white bean dip that Big Sis wrote about on Sunday is a riff on a theme as well – the infamous bean dip with other delish bits. Today we’re going to explore veggie spreads a little more with the queen mother of all bean-based spreads… hummus. I’m imagining that hummus is no longer new to folks, that you have at least had it on a chip at some group event, but I want to encourage you for a moment to REALLY give hummus a good go. It is incredibly versatile – dip, sandwich filling, cracker spread, spoon in mouth (okay that’s me and I REALLY like hummus). Hummus is a great way to add some vegetable protein, fiber, and flavor to your diet in places that might otherwise require mayonnaise and deli meat (we can talk about that more later, too, wow I better start a list). So in my never-ending quest to provide some measure of acceptable variety at lunchtime, I’ve broached hummus a few times. Until a few days ago, however, I never had hummus like this. Throw all of your ingredients into a food processor and go to town. Stop a couple of times to scrape down bowl with spatula. Process until you get the consistency you like. We loved this slathered onto a whole wheat tortilla and covered with a whole mess of spinach and a few slices of avocado. Delish. One of the great things about hummus is that it is the perfect dish to practice riffing on a theme – using a basic recipe and applying different flavor profiles to it. If you look closely at the recipe above, you can see the main components of a hummus: beans, a nut or seed butter (or sometimes just nuts) an acid (citrus is common, but sometimes it’s just vinegar), a little oil, and flavorings. The proportions are important only to the extent that your food processor will spin on its own and create a texture that you like. While my darling spouse and I LOVE, LOVE, LOVED the Baja Hummus, our children were not inclined to give it a go. I think the color did them in. And, silly me, I wasn’t thinking about the fact that they actually DO like chickpeas – a wiser bean choice for the every 4 months or so “let’s see if you like hummus now” test. So after we demolished the Baja Hummus, I decided to make a milder version to attempt a second pass at the hummus accord. I used the above recipe as a guide because I liked the texture of the first hummus and simply changed some of the ingredients to mellow things out a bit. Bits in processor bowl. Go to it. Scrape down sides a couple of times. Run it until it’s the consistency you like. Suggest to your little ones that maybe they’d like some chickpea (okay, so I called them tushies, cause you know the chickpea has a little bum on it and it cracks my kids up) hummus. Totally different reception. Still didn’t win over my picky one, but she at least took a bite. The boy declared it delicious and began campaigning to get his sister to eat some. We will get there. And so will you, just keep trying different versions and you’ll find the one that makes your family go garbanzos (har, har)! Maybe a more Mediterranean version would work (yeah, I know, I’m like a compass, I have to go there). Replace the orange juice with lemon juice or a mix of lemon juice and wine vinegar and add sun dried tomatoes, roasted peppers, and pine nuts. How about a little Frenchy hummus action? That would surely include some thyme and perhaps a little basil. Maybe white wine vinegar in place of the red wine and lemon in place of orange juice. The really great thing here friends is that beans are CHEAP. Buy them dried and boil them at night while you’re doing other things. 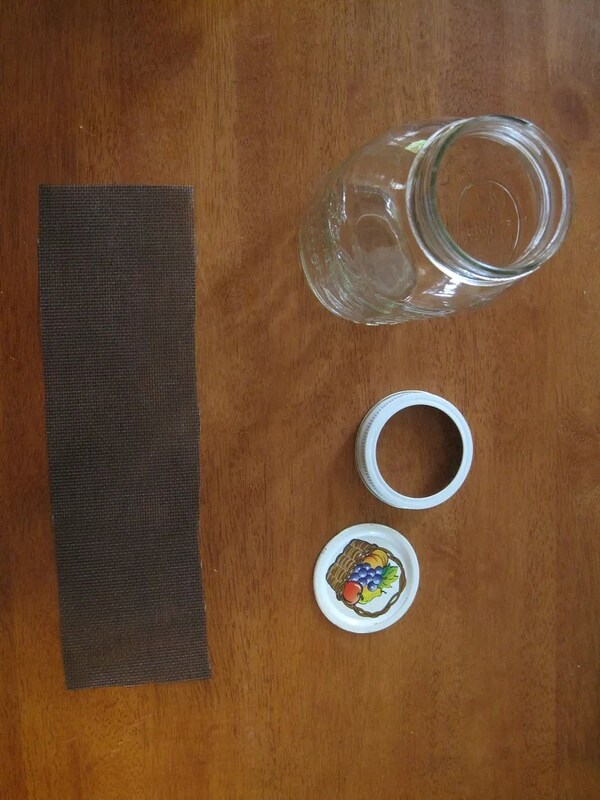 Store in jar in fridge until you’re ready to use them (don’t wait too long, they will spoil) and then you’ve got a really cost effective sandwich filling to spread your culinary wings with. Riff on that theme. Polish those chops. Pretty soon you’ll be improvising with the best of them. And it will be Delish. 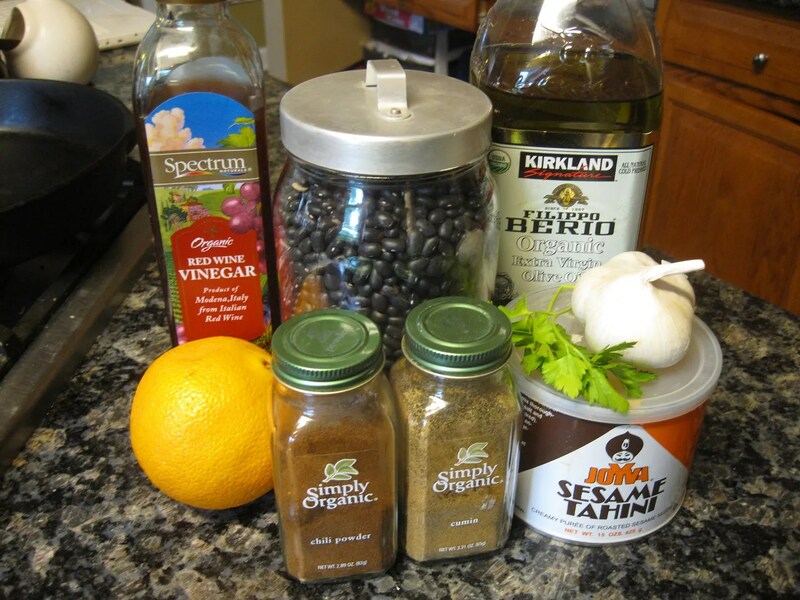 A Note on Cooking with Beans: While canned beans are convenient, they can be loaded with salt and they are, while still cheap as proteins go, far more expensive than dried beans. The problem with dried beans? Well, they’re dried. So whipping something up at the drop of a hat doesn’t seem possible. My solution to this is to either 1) soak beans overnight prior to cooking and using them the next day OR occasionally at night or on the weekend I will do a quick soak (bring beans to a boil, boil for 2 minutes and then soak in hot water for an hour) so that all that’s left is cooking time. If time allows, I will also go ahead and cook them further and store them in the fridge completely ready to go. More info on cooking with dried beans can be found here. Spread those Veggies on Thick! Sorry, my inner 11 year old boy has been talking to my actual 11 year old boy a lot lately. And I’m a nurse. I like gross stuff. But you’d probably like to hear a little more about the veggies and a little less about the bodily functions! On to veggies. Some people do not get all excited about a veggie tray, or tortilla chips, crackers or sandwiches unless they are slathered with something fattening, and/or dairy, and/or chemicalicious like mayonnaise, french onion dip, or ranch dressing. Personally I love mayonnaise, but where I can happily and willingly substitute healthier and especially veggier items in my diet? I’m in. Mayonnaise and creamy dips have competition now! Following are a couple of recipes to get more veggies and less sour cream, mayonnaise (or if you’re buying commercial spreads or dips – MSG, potassium sorbate and questionable milk products) onto your favorite vehicles for spreads and dips. 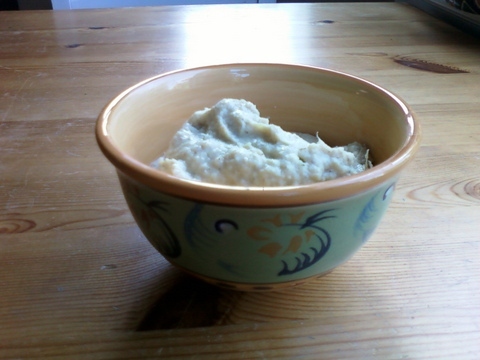 I scraped it into a pretty bowl and provided scooping devices. Voila! That is it. It is delicious, nutritious (artichokes have fiber and vitamin C without fat or much sugar at all) and it really dresses up a sandwich. Now, if you don’t like what you see on the marinated artichoke label or you have un-marinated in the pantry approaching their expiration date, you can jump from the above ‘Easiest’ version to the ‘Easy’ version. Place 3 cups of drained artichoke hearts in the blender or food processor. Scrape it into a pretty bowl and provide a variety of scooping devices. Also ridiculously easy with room for variation according to your taste. 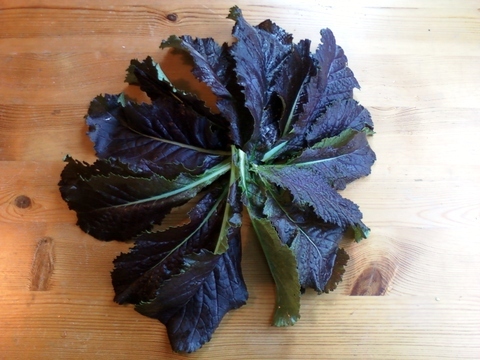 The next spread was inspired by a cilantro-pesto spread described in delicious detail by my friends from ‘Our Spartan Kitchen.’ They had extra cilantro and I have these beautiful red mustard leaves that have a horse-radishy bite to them. With the bite of mustard, this one is really good on a sandwich. Admittedly, this one takes longer to make, and you may not have mustard greens around – however, the basic idea (check out the cilantro-pesto spread as well) gives you the basis to veggify and/or herbify some bean mash into something healthy and delicious. Take the beans, nuts and oil in the above recipe, add some other veggies and spices, adjust for consistency and you will have expanded the repertoire for healthy lunch and snacks. Also check out this sweet pea hummus from Gena at Choosing Raw and let us know about any veggie spreads or dips that you like! Don’t Want to Cook? So Don’t – Eat This! While I love to cook, I know that there are many people who do not. Eating affordable nutritious food without cooking is pretty much a non-starter most of the time in my opinion, but there are many nutritious dishes out there that are so simple to prepare, that anyone (even someone who HATES to cook) can master them with ease. Even those of us who like to cook can use a break from hovering over hot pans now and again. When this happens to me, provided it’s even remotely warm, I look to the garden to see what’s available and build from there. Right now the garden is ALL about greens. Kale, spinach, romaine lettuce. But what to do with them that I haven’t already done millions of times? Namul is a Korean dish that typically involves vegetables, some kind of vinegar or soy sauce, sesame oil, and sometimes chili, garlic, sesame seeds. The vegetables marinate, so if they are remotely tough, they soften or wilt and they pick up the flavor of the other ingredients WITHOUT COOKING THEM. Got that? If you are one of those who does not care to cook (a subject I’d like to come back to at some point here), this is the dish for you. I’ll give you the recipe the way I made it but a more refined version can be found in Ani Phyo‘s Ani’s Raw Food Asia, which is a lovely book and one that I would recommend for a peek by anyone who’s trying to eat more veggies. Place everything but sesame seeds in large bowl and toss. Ideally you should massage this with your hands. I was doing a bunch of other things at the same time, and decided to use utensils instead. 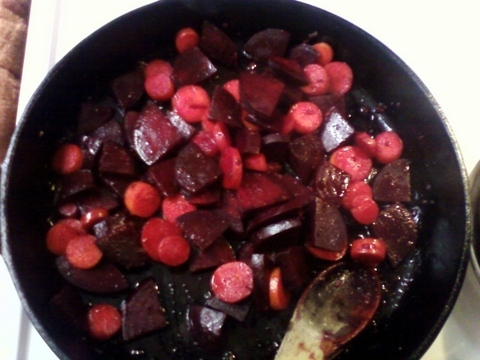 Set aside and let marinate for 20-30 minutes, tossing periodically. Add sesame seeds, toss and serve. Yes, that’s it. How to eat it? 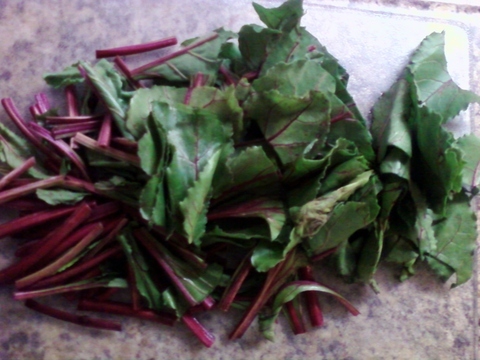 You could use it as a side dish for any protein you like. OR you could do what I did and serve it on top of brown rice with warmed frozen peas and a chopped up asparagus stalk (there’s that asparagus again! still coming a few stalks at a time). Delish. My poor husband missed the first round, so he had it as leftovers, which worked really well, and all he needed to do was warm the rice, then pile on everything else. If it had been a hot day, he said it would have been just as good with the rice cold. It would seem that at least in our house this is a crowd pleaser. And the simple nutrition of it got me to thinking. Surely there would be other combinations that might work as well. Ani Phyo’s book has a variety of namuls, different vegetables, the occasional chili thrown in. I was wondering if the principle of the namul, greens wilted through marinating, could be used with other flavor combinations. Since we’ve been eating less meat, I’ve been using a lot of Asian flavors. We LOVE Asian food, but it would be good to expand the repertoire a little bit…. I decided to try a Italian twist on namul (I can’t seem to stop myself from going Italian). And it was super yum. I’m betting you can guess what to do here. Throw everything but the pine nuts and raisins if you use them in a bowl and massage or toss. 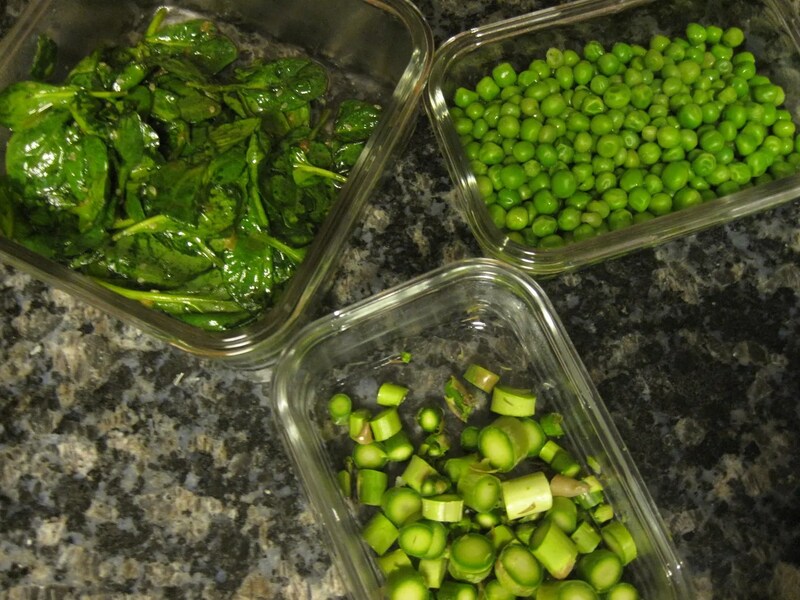 The thicker your greens, the more you should mix, and the more time you want to give it to marinate (20-30 mins). 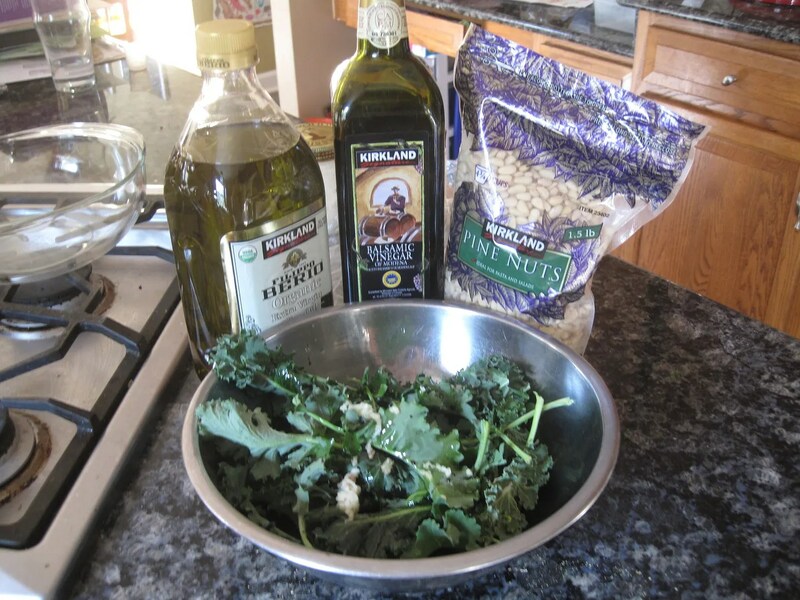 When done, add pine nuts and raisins (if you choose). I served mine with whole wheat shells and garbanzo beans. Delish. How else could we change it? A French version of the Mediterranean greens might use wine vinegar and add a bit of fresh thyme and parsley. 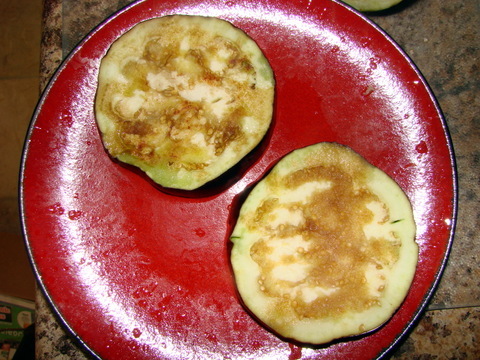 A Japanese version of the original namul might use rice vinegar instead of soy sauce, and come with a side of wasabi, or have nori flakes broken into it. Yum. The possibilities are endless. And they’re all SUPER nutritious. WAHOOTIE! Let’s hear it for namul! !